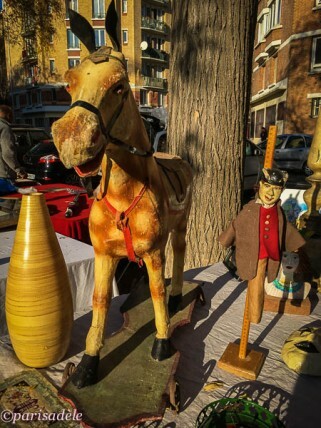 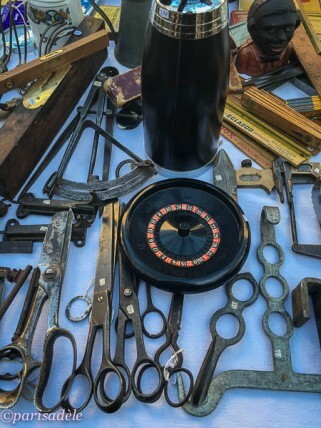 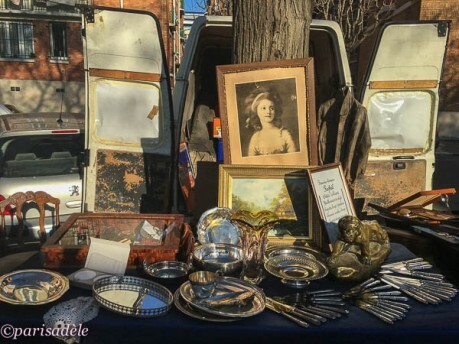 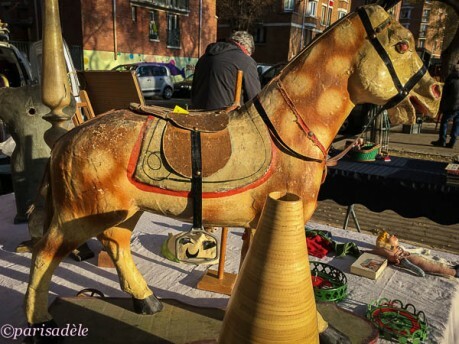 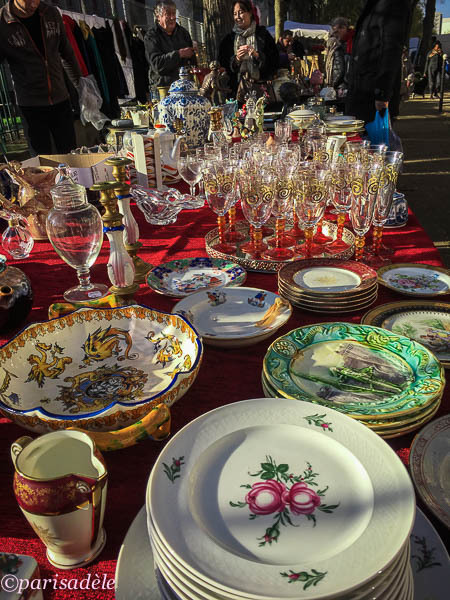 Porte de Vanves flea market is a friendly and vibrant place to spend a Saturday or Sunday morning where you will find a treasure trove of antiques and eclectic retro items. If your idea of fun is rummaging through various stalls in search of the perfect bargain or that certain something that will be your treasured reminder and souvenir of Paris take yourself out to the 14th arrondissement of Paris. 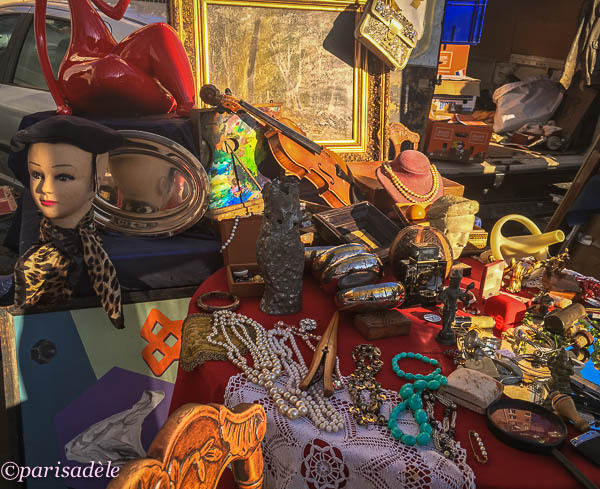 Open every weekend, rail, hail or shine from 7am to 2pm you can join the throngs of casual Parisians and ardent collectors sifting through a myriad of wonders just waiting to find a new home. 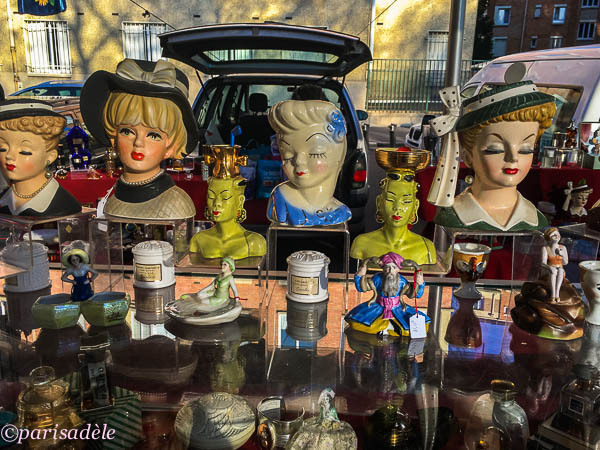 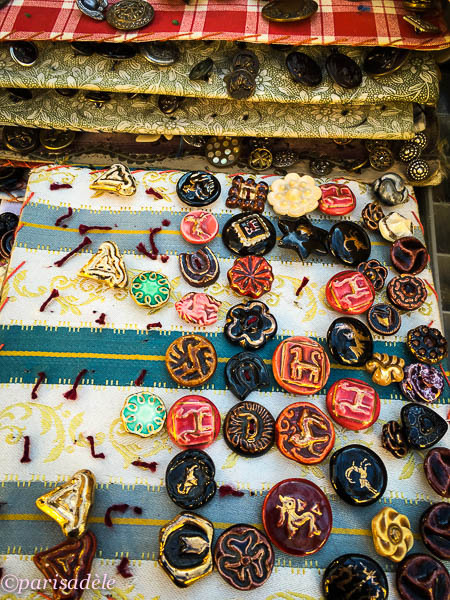 As you can see from some of the images that I snapped during my visit to the Porte de Vanves markets, there is a delightful amount of items to be discovered. Whether it be a set of retro buttons, crockery and glassware, dusty old books, antique toys or even a mounted trophy, there is plenty to admire and observe and perhaps find a place in your home. 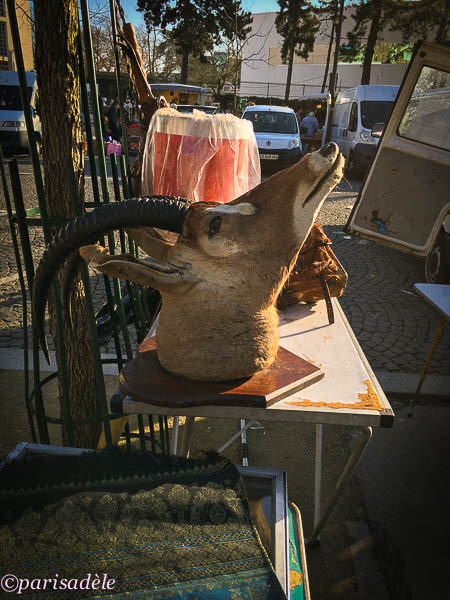 Each time I visit Paris, I like to find something small that will not weigh my luggage down whether it be a kitchen knife, some retro napkins or in this case at the Porte de Vanves markets a couple of sturdy linen tea towels, that I can take home as a souvenir which will play a part of my everyday life and a reminder of Paris. 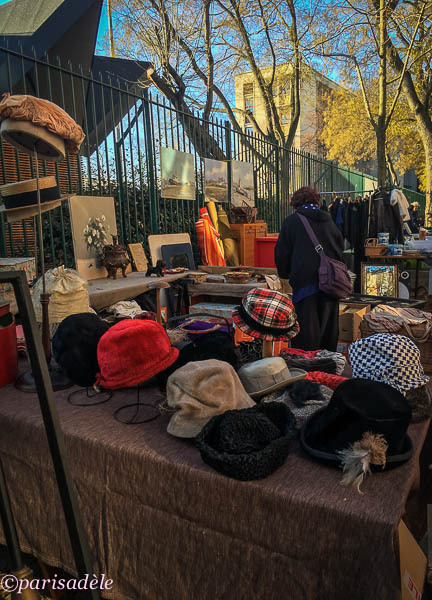 For you it might be a fancy hat, a piece of jewellery, a small trinket or maybe just the pleasure of soaking up the atmosphere of a genuine Parisian flea market. 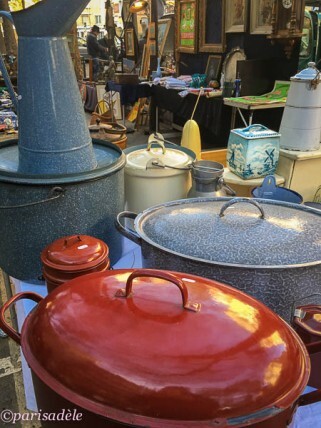 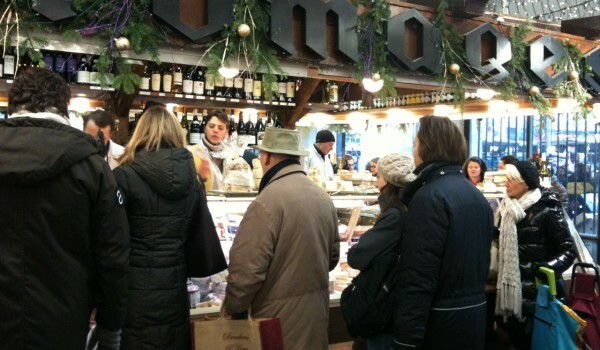 The vendors are friendly, the prices are very reasonable and with only 380 stalls, it is large enough to spend an hour or so without being too big to be overwhelming pushing and shoving your way through the couple of Parisian streets that burst into life each weekend. VISITING A PARISIAN FLEA MARKET is a wonderful way to spend a couple of hours and Marché aux Puces – Porte de Vanves is one I highly recommend. This cheeky little fella, I was soon to discover after taking a photo of him soaking up the winter’s sun didn’t belong to the stall owner of the chair for sale but he decided this was a good place to bask in the sun and take a little nap until his owner whistled him and off he went, running down the path of the market to be reunited with his owner. 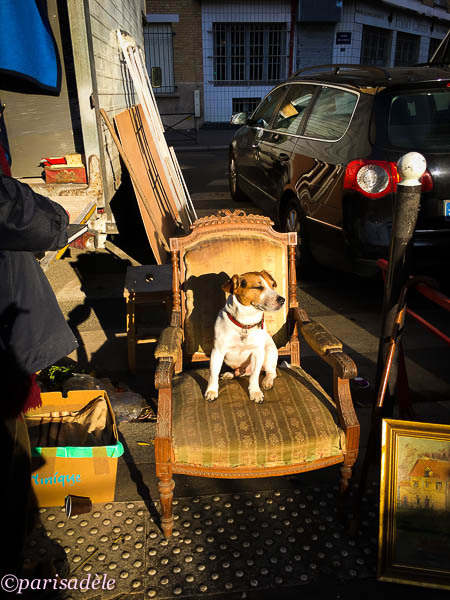 With so many things to observe, whether it be the items for sale, the eccentric stall owners, Parisians sifting through books of old coins or haggling for a cheaper price and of course, the occasional dog, you will be certain to have a fun and entertaining day. 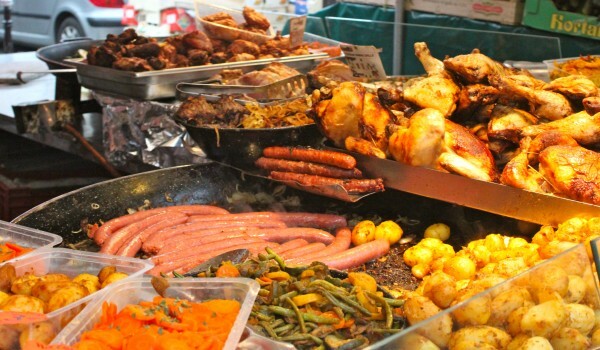 Grab a piping hot crêpe from one of the food vendors, sift through ancient treasures, chat with the interesting vendors and absorb your surroundings. 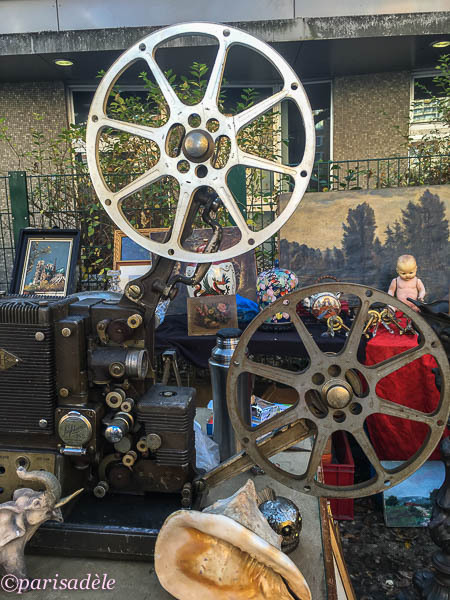 There are so many wonders to discover in Paris, you just need to know where to find them. 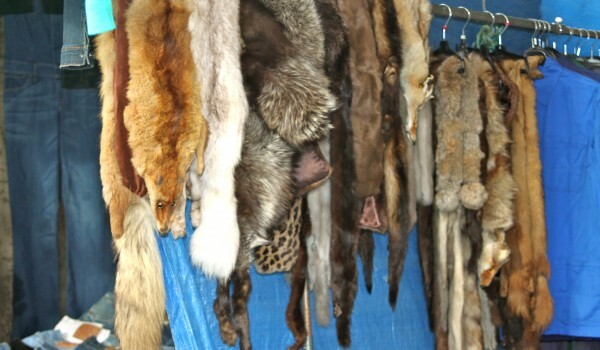 Colourful fabric, car parts, halaal food, fur coats, old books and more. 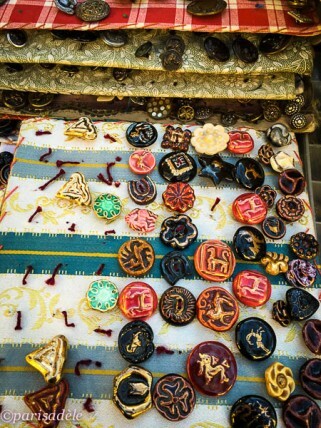 Slightly on the seedy side but that keeps it interesting.